I made little pots of gold to give to my nieces and nephews for a St. Patrick's Day gift. They were so easy to make and you can add any type of treat to them. I made four different festive versions to give you an idea. 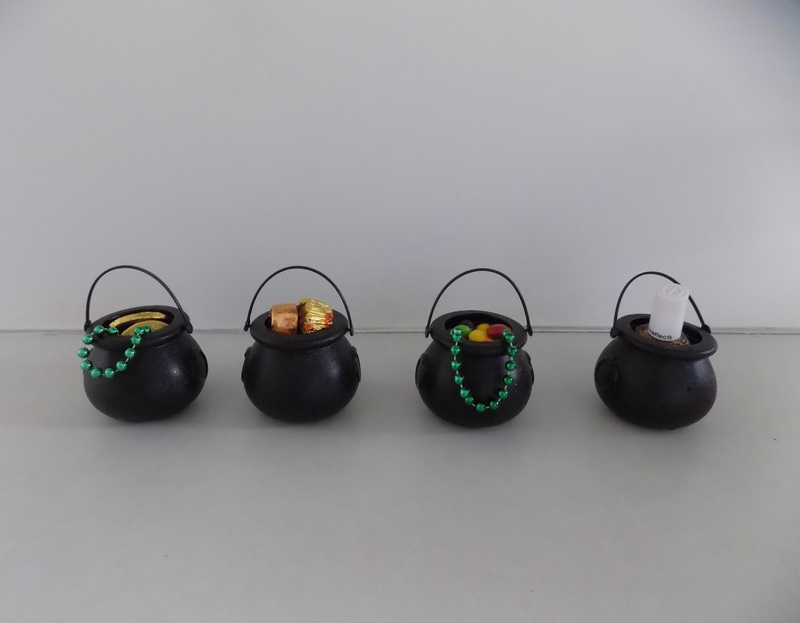 The first pot I filled with chocolate gold coins and a green bead necklace. This is what I gave my nieces and nephews. I like that it includes a little treat and green goodie so you don't get pinched! For the second pot I went with the same basic idea. Candy and a green bead necklace. Instead of chocolate gold coins I used Skittles. I thought this was a good option for those who prefer fruity candy to chocolate. For the third pot I included two different types of gold wrapped candy. I thought this one would be best for the boys as they probably don't care if they get something besides candy in their pot. The last pot is for the girls! I included Skittles and added some gold glitter nail polish. The Skittles allowed more room for the nail polish than the Reese's and Rolos. But you could use them as well. You can add any treats, toys and goodies you'd like! I placed green crinkle paper to the bottom of each kettle for filler and to add color. I got the little kettles from Zurchers, a local party store. You can find them on Amazon too. What are you doing for St. Patricks Day?